Michael Douglas is Gordon Gekko, ruthless and amoral corporate raider, the ultimate personification of corporate greed. 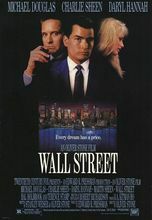 Charlie Sheen is Bud Fox, an impatient low-level day trader whose aspirations for success bring him to betray his father and provide illegal inside information to Gekko. After a disingenuous speech to placate its workers, Gekko asset-strips the airline Fox's father spent his life to help build. Douglas won an Oscar for Best Actor. Rocco Anacarola ... Maitre'd "21"
Martin Sherman ... Banker at "21"
Monique van Vooren ... Woman at "21"
Derek Keir ... Busboy at "21"
George Vlachos ... Maitre'd "Le Cirque"
Liliane Montevecchi ... Woman at "Le Cirque"